The short section of test track which was mounted on a strip of cork underlay and glued to a piece of timber was taken out to the garage because one didn't want the fumes to infiltrate the house and obviously the spray paint was bound to travel further than the track itself. However, eventually, the main layout will have to be spray painted in situ in the house - I will then have to think about controlling the drift of the spray and the presence of fumes. The top picture is obviously before and the bottom picture after. 1. I think the colour is OK. 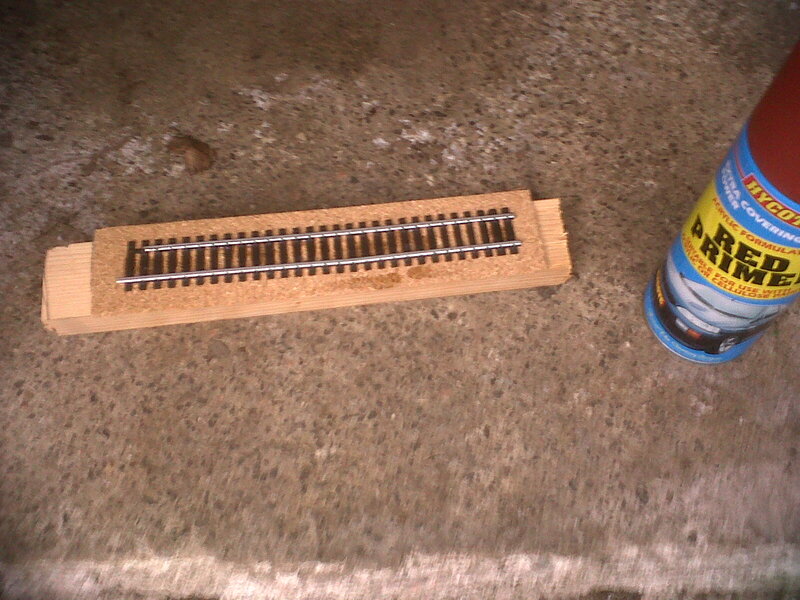 It is meant to simulate the rust that seems to spread across rails, sleepers and surrounding areas. 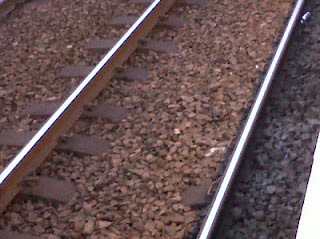 This photograph was taken with my mobile phone at a local station. 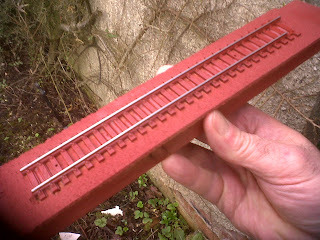 It shows the spread of that rusty colour with only the top surface of the rails standing out as something different. Admittedly, the colour is much more muted than my spray paint version. That I think is much to do with the limited characteristics of the phone camera - it always takes a dullish photograph. However, I will experiment further tomorrow with splashes of grey spray intermingling with red spray - not sure if one can mix spray paint in mid air in this fashion but I will try it. 2. Remember, ballast is still to be added. 3. 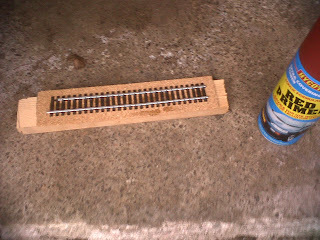 Cleaning off the paint from the top surface of the rails (and from the inner flange - see yesterday's blog about the necessity of doing that) was accomplished effortlessly by wiping immediately after spraying with a piece of kitchen towel that I ran quickly along the rails (one at a time) and with the towel folded over the inner side of the rail to clean the inner flange. (November 5, 1946 – September 19, 1973) was an American singer, songwriter, guitarist and pianist. Don't know much about him but his name was very familiar to me growing up in the 60s because he was a member of the Byrds. Anyway, on a whim, purchased his biography last week. "Just because we wear sequined suits doesn't mean we think we're great, it means we think sequins are great." Referring to an incident in his teenage years: "Then one day in Chapel Hill, North Carolina, Gram Parsons' voice came floating out of a dorm window onto the quad where I was throwing a Frisbee with my long-haired Southern soul-obsessed friends. And that was it .........................Gram Parsons' voice was then, and remains today, the most moving white voice I know." 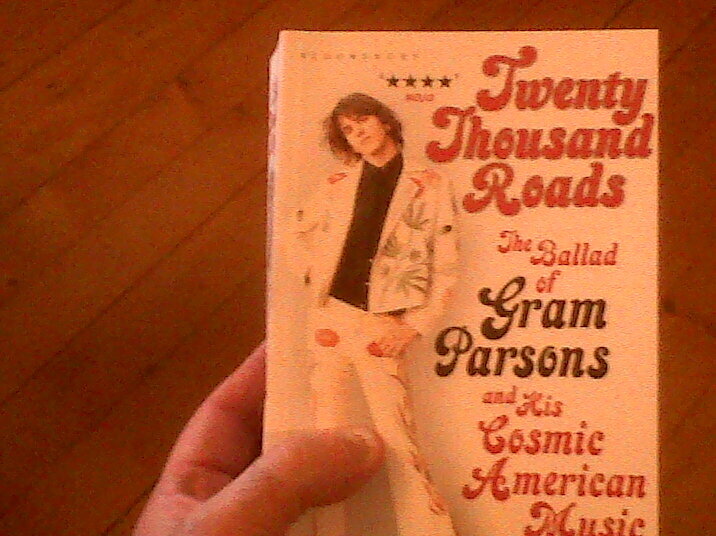 He then lists a whole stream of American singers among which he considers Gram Parsons' deserves to be placed and sums them up thus: "American voices that transcend any rational discussion." It reminded me that the voices of popular 20th Century American singers are a) hugely varied - Chet Baker to Captain Beefheart and b) all have something in common - they resonate with Americana.